6 T. butter, room temp. Using a hand or stand mixer, beat together the eggs and sugar until well combined. Beat in the pumpkin, cinnamon and cloves. Beat in the flour until well combined, scraping down the edges of the bowl, set aside. Cover a 15 x 10 jelly roll pan with parchment paper and then grease and flour the parchment paper (I used butter). Pour the batter over the parchment paper and use a spatula to spread it around evenly in the pan. Place in a 375 degree oven and bake for 12-15 minutes, it should spring back when you poke it. Meanwhile, cover a thin dishtowel (as large as the jelly roll pan) with 1/4 C. of powdered sugar. Once the cake is done, carefully turn the cake out onto the dishtowel (I hold the sides of the parchment paper for this). Carefully remove the parchment paper from the cake and then gently roll up the cake and dishtowel together, starting with the narrow end. Place on a wire rack to cool. Make the filling by beating together the cream cheese, butter and vanilla. Once well combined, add the sifted sugar and beat for 1 minute. 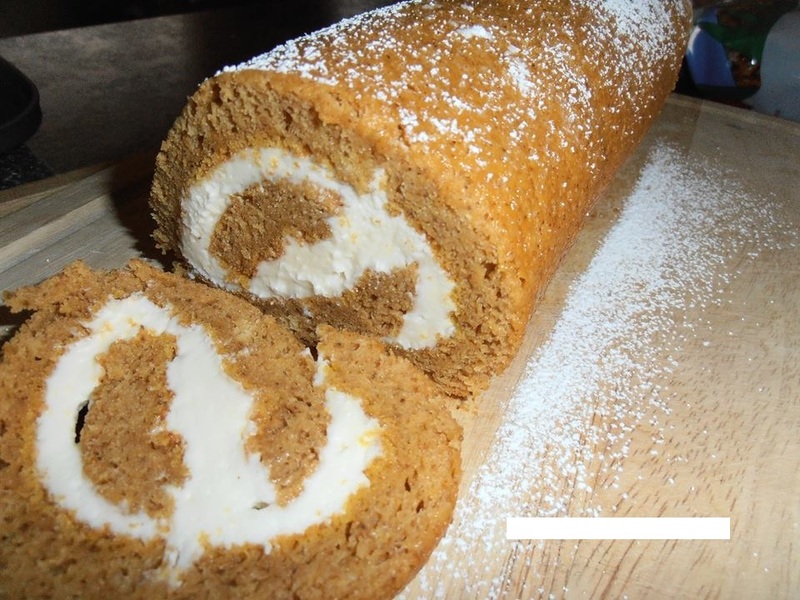 Once the cake has cooled, carefully unroll the cake and then spread the filling over the entire surface. The starting with the narrow end, reroll the cake and wrap in plastic wrap. Place in the fridge for 2 hours before slicing. Dust with additional powdered sugar if you like.